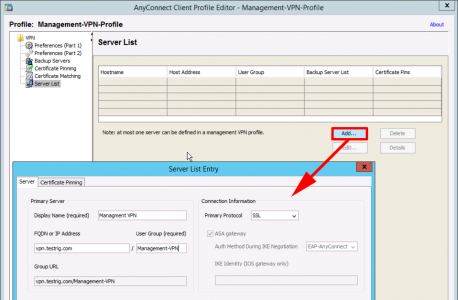 With the newest version of AnyConnect (4.7) there’s an added feature called ‘Management VPN’. It’s there, so that if you have remote users who don’t VPN in very often, then you may struggle to mange them, e.g. 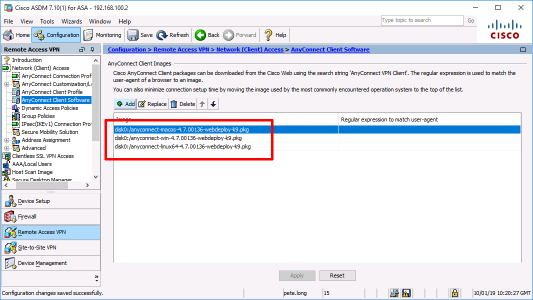 put software updates, AV updates, SCCM packages etc. down to them. 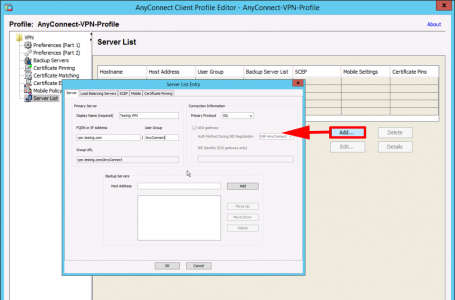 Before version 4.7 you could configure ‘Automatically Connect’, or ‘Start before Logon’ to handle these problems, well now you can use Management VPN. What it does is, it automatically connects (using the computer certificate to authenticate), and it automatically disconnects when a remote user brings up a normalAnyConnect VPN user connection. 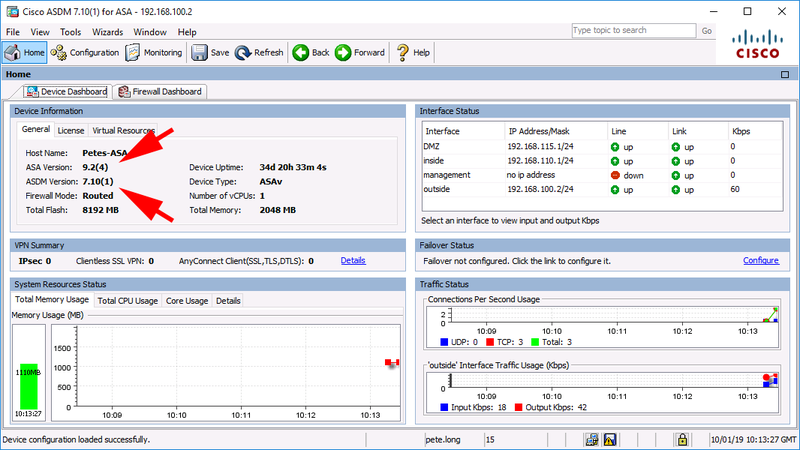 When they disconnect again, the Management VPN (after a few seconds) will re-establish again. I’ve got a Windows 2012 R2 Server that’s doing Certificate services and DHCP, I’ve also got an external (Windows 7) client with AnyConnect 4.7 installed. 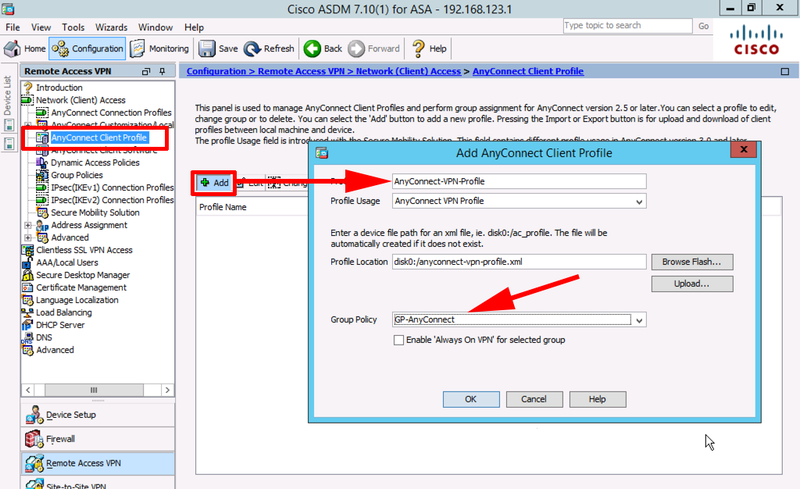 My first task was to setup normal user AnyConnect, which I secured with certificates, (user certificates), I sent the certificates out using auto-enrollment. 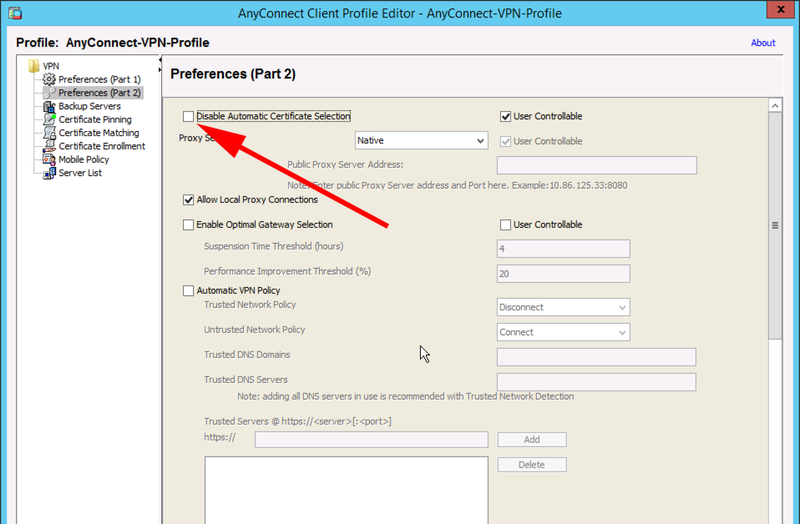 Also while I had my certificate hat on, I generated a certificate for the outside of the ASA as well. (I didn’t bother setting up NDES I just imported the CA Certificate eon the ASA). 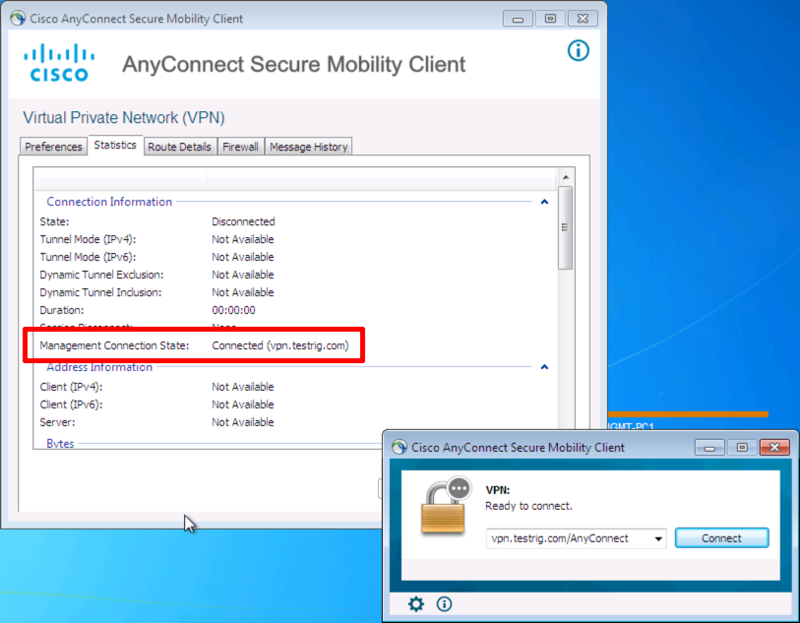 Note: If you already have working AnyConnect, then you can skip this section. 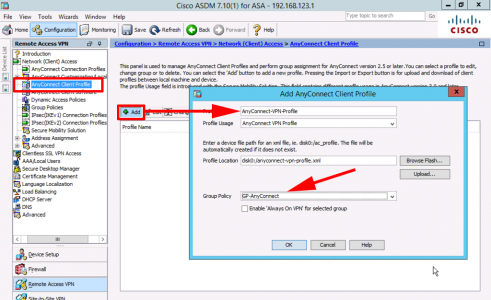 In addition, (much as I prefer to work at CLI, you need to go into the ASDM to do the following). 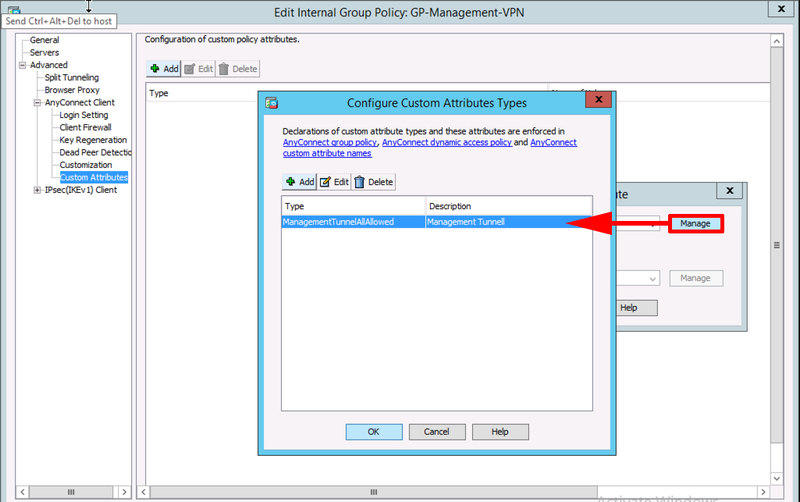 Create a new connection profile and associate it with the group policy we just created (above). Add to the ‘Server list‘ the URL you specified (above). 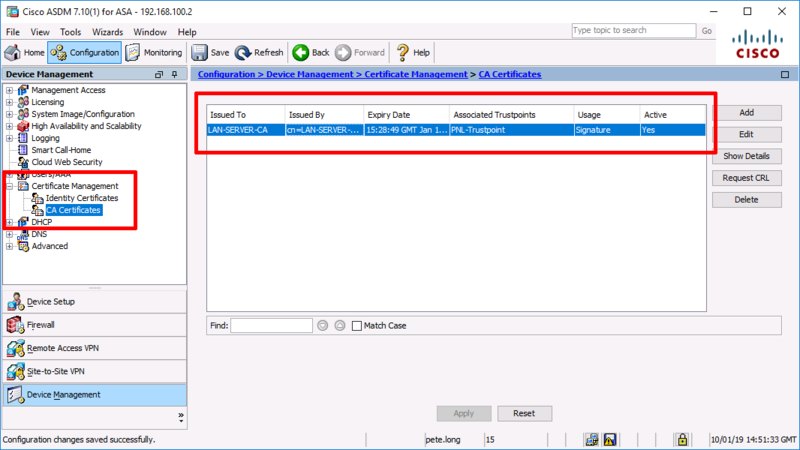 To avoid being prompted for which certificate to use, untick ‘Disable Automatic Certificate Selection’ (Yes the name makes no sense to me either!) Save the profile. Then make sure the VPN works as expected. 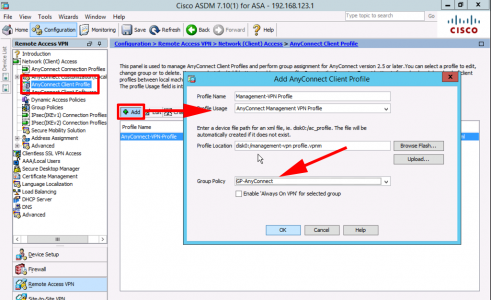 Your ASA needs to be running newer than version 9, and your ASDM image needs to be 7.10(1) or newer. 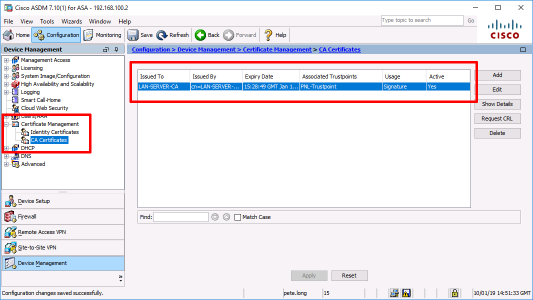 I’ve already mentioned certificates, but you will need to have the CA certificate from the CA that’s generating your COMPUTER certificates installed and trusted, mine’s already there, as I’m already authenticating my USER certificates with it. Add another Tunnel-Group and Group-Policy for your Management-VPN, I’ll drop back to CLI to do that (to keep things neat and tidy). Add a new connection profile, set the type to ‘AnyConnect Management VPN Profile’, and link it to the Group-Policy for your AnyConnect USER connections. 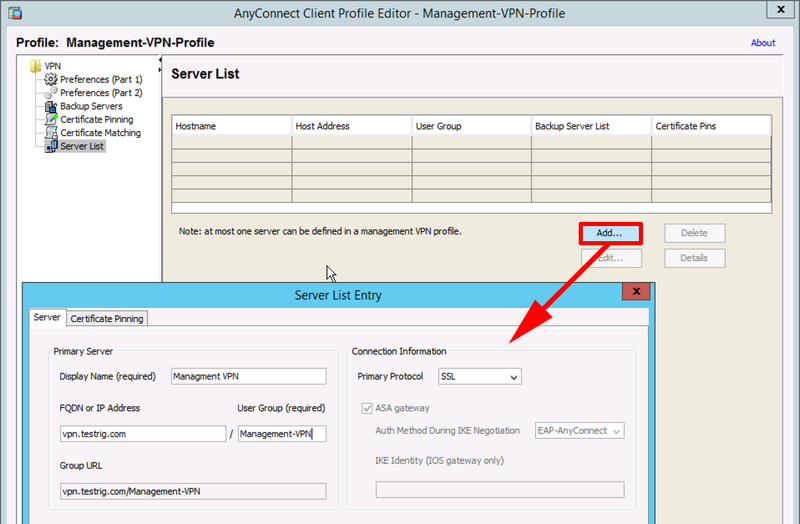 As before add an entry to the server list with the same URL you specified in the Management VPN tunnel group. 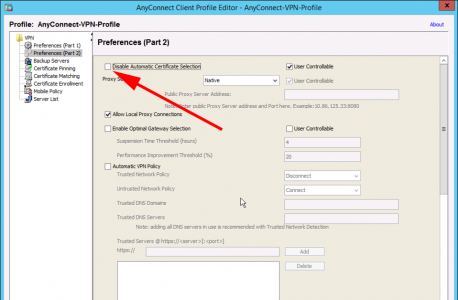 Add an Automatic VPN policy, to connect whenever you are on a network that is NOT your corporate network. Here if a client sees my server, on the same network, or gets my domain name via DHCP it WONT connect. 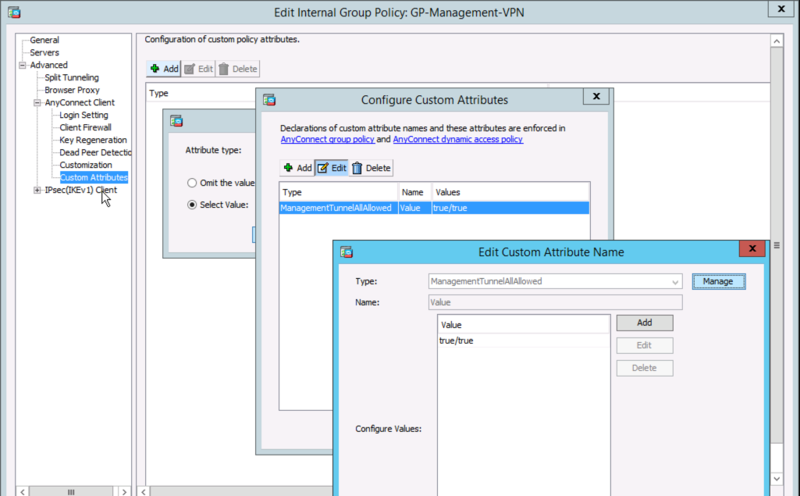 Edit the Group-Policy you are using for Management VPN > AnyConnect Client > Custom Attributes > Add > Create an Attribute called: ManagementTunnelAllAllowed. Create a value for it called true/true. 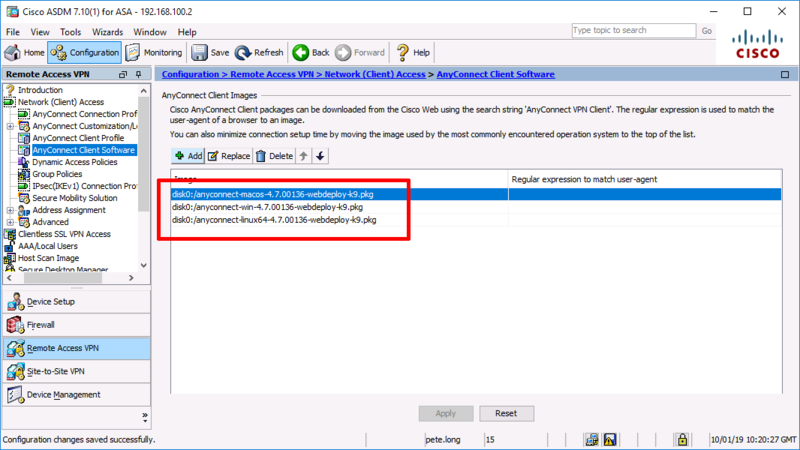 In the ‘AnyConnect Client‘ section, ENABLE ‘Client Bypass Protocol’. 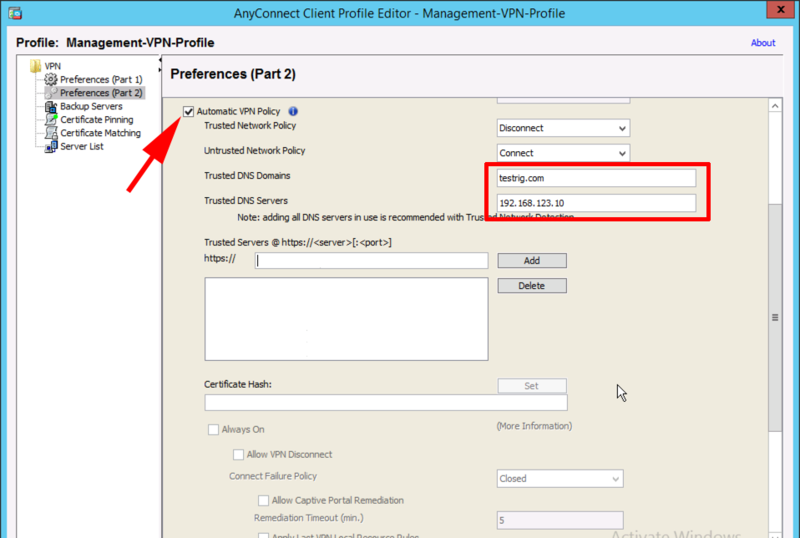 Your client will need to connect at least once to get the new settings, once they have when they disconnect the Management VPn will establish. 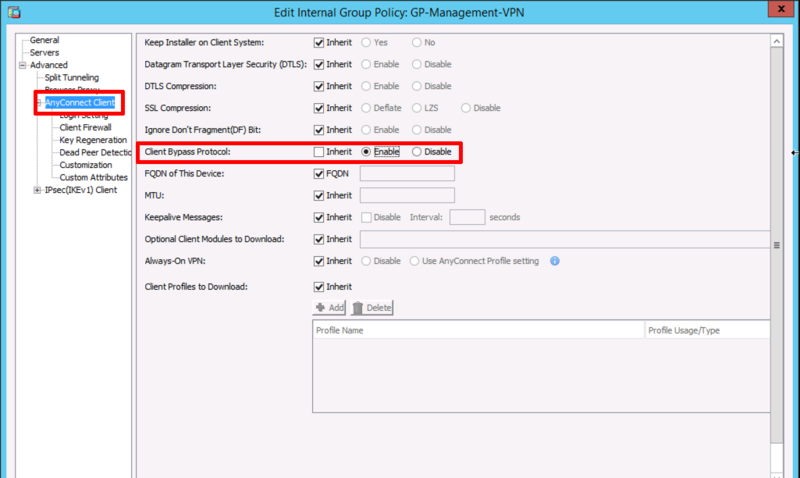 As soon as the user tunnel comes up, the Management VPN tunnel will drop. Thank you for the article. I am trying to think of a use-case for this setup. It seems that if your resources are not segregated, little benefit is gained with this setup vs Automatically Connect feature. Most high-security organizations these days require full-tunnel VPN with automatically connect to VPN when on untrusted network so that is why I am asking the question. 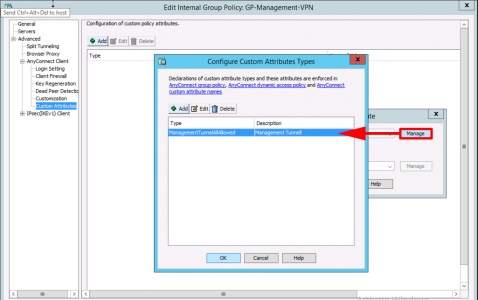 To summarize: If organization wants to enable auto VPN for management purposes, but also wants to protect other resources with User based/2FA authentication requirements this solution is for them. 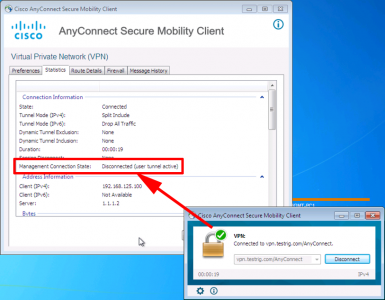 But if organization has management apps (DC/AV/SCCM/WSUS etc…) and other applications which they do not want to protect with additional authentication, they gain little with this solution? 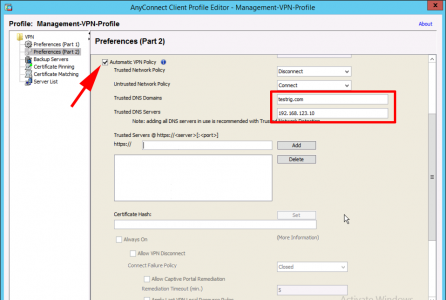 I have a situation where I have a remote server in a secure facility that allows me to establish a client VPN session out, but I cannot have a static public IP NAT’d through to my LAN firewall segement. i.e. 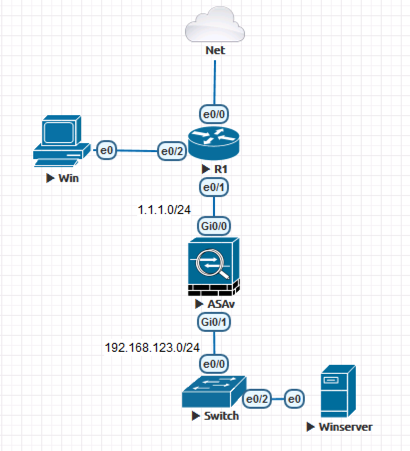 I have a private LAN behind my building owner’s firewall. 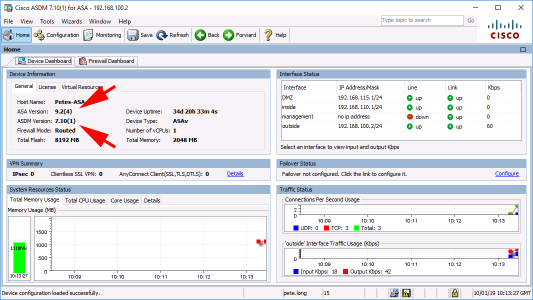 I need remote access to this server – especially after restarts, etc. 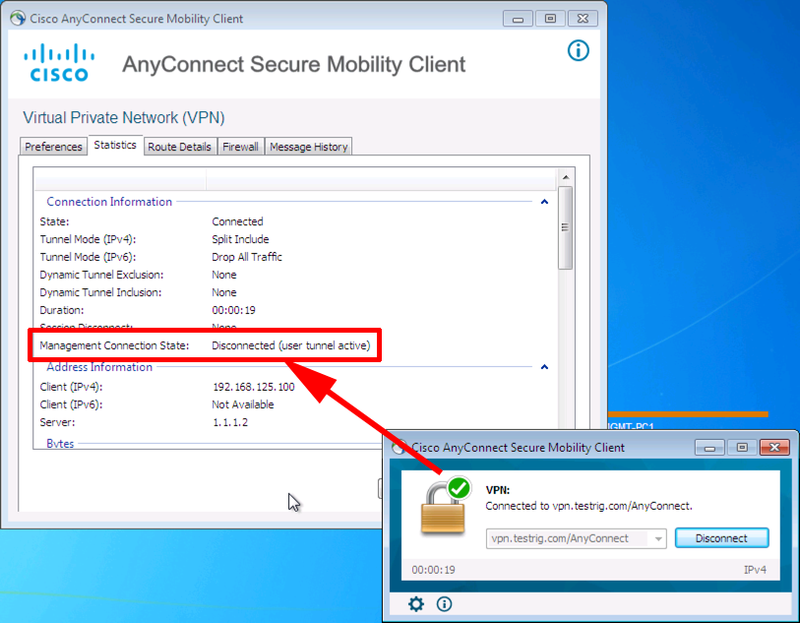 I’m thinking this solution would meet this need, as it allows me to have a client VPN session to this device without having anyone logged in. Other than this, many orgs have techs or remote workers that only occasionally need access to resources behind the VPN and may go for months without using it, yet still need group policy updates, etc. The increasing use of SaaS apps over https minimizes the need for daily vpn needs – this seems like a way to control the desktop without requiring them to actually use the vpn. And you don’t have to remind them of their credentials or renew certs when they realize it expired. 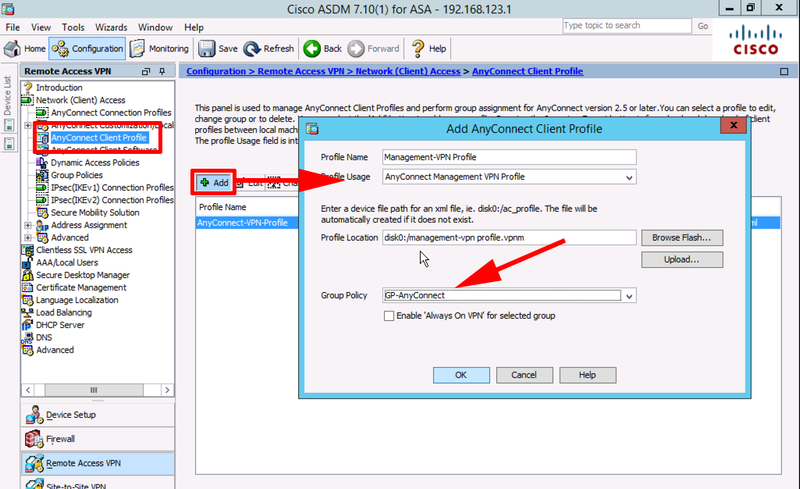 That would be a use case, I did something similar, a few years ago when AWS didn’t support VPN to Cisco ASA, I had a AWS host that AnyConnect VPN’d to a clients site as soon as it booted up, and then I had one IP in the remote pool so it always got the same IP.